I was going to write this another day (heh), but I've been preempted by an article in Slate magazine. Amidst the procedurally generated games I listed on the PCG Wiki, I slipped in Minesweeper as a way of leading into a discussion about what constitutes a PCG game. 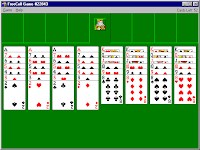 I was going to argue that Minesweeper is PCG, but Solitaire is not. The reason being that randomness is a necessary but not sufficient condition for a PCG game. What is important is biased randomness. Procedural content is about exploring a set of rules underlying a seemingly random system. I wanted to exclude a game I deemed 'sufficiently random' that was clearly mental junkfood to compare it to a more controversial position that Minesweeper is PCG. Apparently though, Solitaire is not mental junkfood (supported by an intelligent comment on Slashdot. Now the world has turned upside down, you can return to your regular service). So feel free to argue for either game as being PCG. And the consider, is Poker a procedurally generated game? What is important is biased randomness. Procedural content is about exploring a set of rules underlying a seemingly random system. What do you think is the set of rules behind Minesweeper? I've always believed the generator just places the mines randomly. The 'rules' of minesweeper are based on the information I currently have, which is the next best click to make. In this instance, the mines are static (e.g. already placed) and therefore usually the next move is predictable. Are you sure the mines are placed after the first click, instead of when you click on "New Game"? And regarding the rules, I thought you were talking about the algorithm used to place the mines, not the one used to solve the puzzle. My opinion is that the mines are just placed randomly, since I've never noticed any pattern (or "emergent behaviour") in the games I've played. I've just run 20 games on a 16x30 grid with 99 mines, which gives me a 99% confidence that I'm right and the mines are only placed after you make the first click (otherwise I would have had at least one death on the first click in those 20 games). Version was Vista Home Premium, which is as hi-tech looking a minesweeper I've ever seen. BTW: I can never entirely prove that I'm right about this, of course, since all you have to do is show me one game that you died on the first click, and I have to show you all possible games that you didn't. Consider this an example of the Halting Problem, Godel Incompleteness Theorem, etc. I've just started 30 games with 64 mines on a 9x9 board, and every time the first click happened to be on a mine-free tile. So the chances that you're wrong are below 1 in 10^20. I must definitely admit that Minesweeper is procedurally generated. PS: Before trying winXP's minesweeper, I did the test with winemine, and I found a mine on the first game's first click. I'm sure the mines in Minesweeper are not random placed. I've programmed a minesweeper-clon with this "feature" and the game was almost unplayable, because the mines agglutinate too much. WinXP and Vista also have a different generator. In Vista the Mines agglutinate more so you can see higher numbers like 6 more often, but there are lesser situation where you have to guess. Never thought, that there are complex problems behind this simple game :( Maybe looking at the source-code of K-Mines will clear the sky. But for myself this would be cheating.